Situational awareness: President Trump and European Commission President Jean-Claude Juncker announced this afternoon that they will open negotiations to, as Trump put it, "work toward zero tariffs, zero non-tariff barriers and zero subsidies." They did not announce any tariff reductions. 🚨Breaking: Facebook stock was down roughly 10% after hours today after reporting that it missed revenue and user growth estimates. 1 big thing: Greece's "biblical disaster"
Greece's wildfires have killed more than 80, and a government official is accurately deeming the events a "biblical disaster," Axios' Andrew Freedman reports. The big picture: Officials sifting through charred wreckage have found that these blazes were so swift-moving and burning so hot that many victims had virtually no chance of outrunning them. Some victims were found still hugging each other, according to news reports. Between the lines: While an arsonist's match, a downed power line or another ignition source might have been the spark for these blazes, the changing climate and ongoing heat wave acted as accelerants — ensuring that the fires would be an extreme event that would stand out even in a region prone to wildfires. 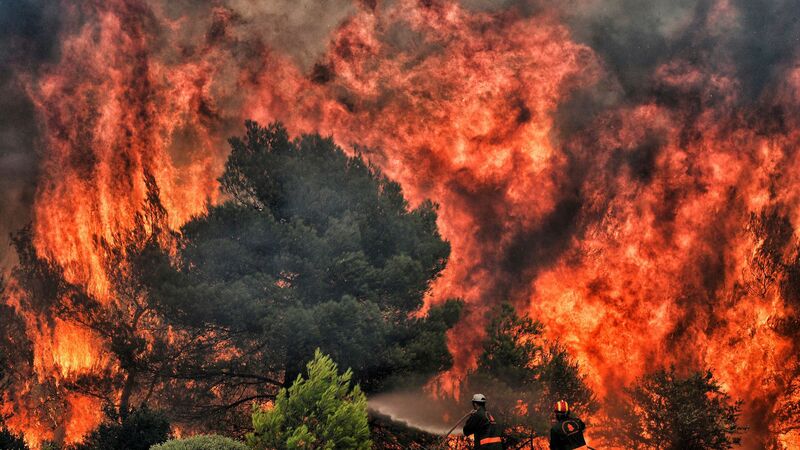 The Mediterranean's summers are getting hotter and drier, making larger, more dangerous fires more likely. In 2017, that combo led to disastrous fires in Spain and Portugal, but this year, it's been Greece's turn to experience the worst of the damage. This is particularly the case in areas where people have built homes up against, or in some cases within, forested lands that historically has experienced fire. The bottom line: Greece is facing a national tragedy that has multiple causes. Increasingly, human activities are dialing up the threat level for fires like this one, making us more at risk to future disasters. P.S. Visitors are being ordered out of Yosemite Valley to avoid unhealthy air quality and other risks posed by the two-week old, 38,000-acre Ferguson Fire that is raging nearby. Go deeper. "A man, identified only as Emiliano, spends time with his son, Hermy, 8... Emiliano and Hermy, originally from Guatemala, were reunited at an I.C.E processing center about two months after the two were separated." The White House is delaying a potential visit by Vladimir Putin. John Bolton says it will be pushed until after the Mueller investigation is finished. Go deeper. Trump's tweet on CNN airing the Michael Cohen tape: "What kind of a lawyer would tape a client? So sad! Is this a first, never heard of it before? Why was the tape so abruptly terminated (cut) while I was presumably saying positive things? I hear there are other clients and many reporters that are taped - can this be so? Too bad!" A body of liquid water may exist under the icy surface of Mars' southern pole, according to new research published Wednesday in the journal Science. Go deeper. A series of Syrian suicide bombings and raids has left at least 183 people dead, including 89 civilians. AFP reports. Waymo is starting a test pilot program with Walmart in Phoenix that will allow the retailer's customers to use its autonomous car service to pick up groceries at stores as soon as this week. CQ Roll Call is set to be sold to D.C.-based FiscalNote, executives from both companies told WashPost.